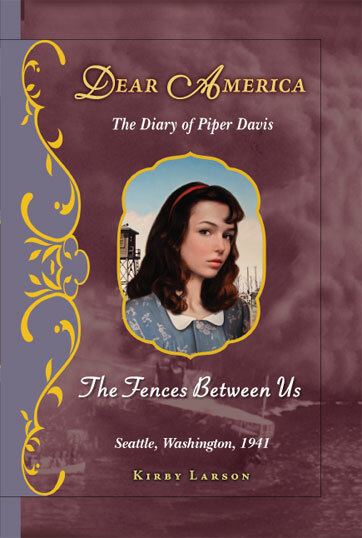 The Fences Between Us: The Diary of Piper Davis, Seattle, Washington, 1941 by Kirby Larson. Scholastic, 2010. Currently available. Face Value: This is the first book from the 2010 relaunch of the series. Because the old 1990s covers are so familiar and meaningful to me, I was happy to see Scholastic maintain some of those elements in the updated series. They are still beautiful covers featuring illustrated portraits of the protagonist. The picture of Piper on this book is very realistic, and you can tell that it was created in 2010 to look like something from the 1940s. The images on the older covers were often taken from paintings that were created in the time period about which the book was written. I miss the old portraits, especially because Piper in the portrait looks much older and more mature that the 7th grader we meet at the beginning of the book. I appreciate the background detail in the portrait, hinting that Piper will somehow be involved with the U.S. American incarceration camps that came about after the United States got involved in WWII. The updated covers also feature gold embossing which makes the hardcover books look more like an actual diary. It’s a nice touch. Does it break the slate? At first, Piper is nowhere near a Slatebreaking character. She is obsessed with a boy and worries more about whether or not she will be allowed to wear lipstick than about the social unrest in her own community and nation. She grows to become a much more self-aware young woman, and she also grows in her understanding of the cultural dynamics at play during the heat of WWII. Although Piper may not take charge in advocating for Japanese American citizens’ rights, the significant changes in Piper’s attitude and behavior demonstrate how a young woman can mature into her social conscience. She is well on her way to becoming a Slatebreaker. Who would we give it to? Any young reader living on the West Coast should be reading about the internment of Japanese American citizens during WWII. I would pair this book with a nonfiction title about the incarceration camps and encourage kids to read both. Of course, kids all over the US should know about this part of our nation’s history, but I think it is especially important for those children living in regions where the internment camps were located. There was an internment camp in Arizona not far from where I live now, and it made my skin crawl to read about the terrible conditions at the Idaho camp and to think about how awful it would have been in the summer in Arizona. Review: In the fall of 1941, all is well in Piper Davis’s family. Piper’s father, a preacher, devotedly serves his congregation at the Japanese Baptist Church of Seattle. Piper’s brother Hank watches out for her and enjoys his status as one of the most likable guys around. Her older sister Marjorie is doing well in college and enjoying a blossoming new romance with her boyfriend, Stan. Although the rest of the world is at war around them, the Davis family is content with he fact that the US is not involved…yet. When Piper’s brother Hank announces that he has joined the Navy and will be stationed in Hawaii at Pearl Harbor, the family dynamic begins to change. Piper’s dad warns Hank that he may be in for more than he anticipated, as the US is on the brink of getting involved in international conflict. Hank insists that everything will be fine. Although the Davis family eventually learns that Hank survived the Pearl Harbor attack, Piper lives in constant fear for her brother’s safety. Between those worries and her concern about her budding romance with a boy at school, Piper barely has time to consider the difficulties facing her Japanese neighbors. As her father becomes more deeply entrenched in efforts to preserve their civil rights, Piper finds herself confused and annoyed. Why is her father spending so much time working with the members of his congregation when his family has its own struggles? Should she hold her Japanese friends and neighbors accountable for what is happening overseas? It is as Piper considers this conflict that she begins to grow from a self-centered teenager to someone who makes a genuine effort to understand others’ struggles. Piper’s consciousness raising journey is what makes this book so compelling. Through the diary entries, Kirby Larson has beautifully constructed a character’s transformation. I have heard from my relatives who lived through the second world war that life on the homefront forced many a young person to grow up very fast. For readers in 2012, that is hard to understand. We are also living in a country at war, but the experience is vastly different from what people experienced in WWII. For most of us, the war overseas does not affect our everyday lives. To read about Piper’s sacrifices allows us to gain a better understanding of a time when war looked very different both for those fighting and those at home. When the Japanese American citizens of Seattle are forced into internment, Pastor Davis decides that he and Piper will move to Idaho and live near the internment camp so that he can continue ministering to his congregation. Piper is understandably upset by this change. She is expected to leave her friends and her school to accompany her father. And her big sister will be staying behind to work in a factory, leaving Piper on her own throughout the drastic transition. She responds to this change with some bratty behavior typical of an unhappy teenager. Although this shows Piper at what is perhaps her least appealing, it is useful for us to see her respond in this way because it makes her intellectual journey even more significant. Once in Idaho, Piper gets a taste of the terrible quality of life for those who live in the internment camp. Although she attends school and eats most of her meals at the camp, she recognizes how lucky she is that she gets to go home to a real house at the end of the day. And although some of the locals ridicule her and her father for working with the Japanese American citizens, Piper realizes that this discrimination is nowhere near as bad as what the internees experience. Her values shift and she starts to appreciate things that she previously took for granted, such as conversations with her older sister and the comfort of a warm home. When Piper receives letters from her former friends she marvels at the trivial things that used to consume her time and she sees that sometimes a person has to choose between living an easy life and living an ethical life. She grows from a boy-crazy girl into someone who thinks deeply about the world and her fellow citizens. Piper’s relationship with her father is fascinating. Because her mother died when she was very young Piper’s dad is the only parent she has ever known. He is a caring parent, but strict, and his rules often feel limiting for Piper. He spends so much time advocating for the members of his congregation that at times Piper worries that he will neglect his family. Part of Piper’s growth is her process of understanding how important her father’s work is and how meaningful it is to him. As she makes peace with her father’s professional identity, their relationship deepens and they find ways to bond during the tough changes taking place within their family. I loved that Piper was a budding photographer. This was my favorite aspect of the character because her evolving skill as a photographer reflected the other changes in her personality. At first she is concerned its capturing the fun and beautiful moments of life. But as things change in her world, Piper learns that it is also important to take pictures of the tough moments, the moments of despair, and the very ugly things that happen in the world. She begins to research Margaret Bourke White and dreams about a future in which she can use her talent to change the way people think about the world. I loved this inspiring twist to the story – it made Piper stand out from the host of other WWII era homefront heroines. My one qualm with this book has nothing to do with the writing or the characterization, but rather the approach to the subject matter. In this book, the story of Japanese internment is told from the perspective of a white girl. This is something that is unfortunately common in the Dear America series – the story of an oppressed group during US history is told from a white participant/observer perspective. This was especially unfortunate because the story featured a character who would have been the perfect person to tell the story: Betty, a close friend of Piper’s who lived in the internment camp. Yes, Piper’s perspective was unique because of her family’s situation and the conflicting allegiances between which she felt caught, but I still questioned the telling of this story from a white person’s perspective. Revisiting the Dear America series has been a total treat, and I am thrilled that this newly released addition to the series had the same trademarks that kept me reading when I was much younger. Kirby Larson writes historical fiction with such amazing attention to detail, and Piper’s story is engrossing. Whether you are checking out this series for the first time or introducing a young friend to the series based on your own fond memories, it is comforting to know that the Dear America series has stood the test of time and is still delivering excellent historical fiction for young readers. This entry was posted in Middle Grade, Reviews, Theme Week and tagged Dear America, Historical Fiction, internment camps, Kirby Larson, Pacific Northwest, Theme Week. Bookmark the permalink.